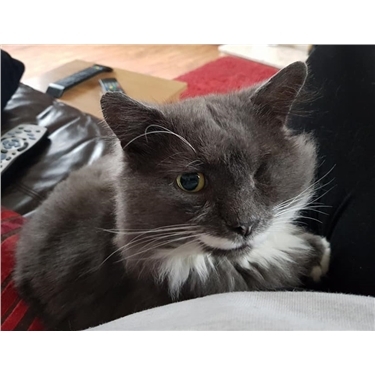 Named after a one-eyed warrior from the popular TV series Game of Thrones, Beric had a rather tough life living as a stray in Llandudno Junction, gathering a few scars and a nasty damaged eye. A kind lady had been feeding him and contacted us to help him. We removed his eye and he was a little star throughout his time with us. He was then neutered, vaccinated, microchipped, treated for parasites and publicised for rehoming. He has now been snapped up by a cat lover from Old Colwyn and renamed Derek! We couldn't be happier for this fantastic cat. Good luck in your new home Derek, hopefully no more battles for you!